I'm a big Metal Men fan. 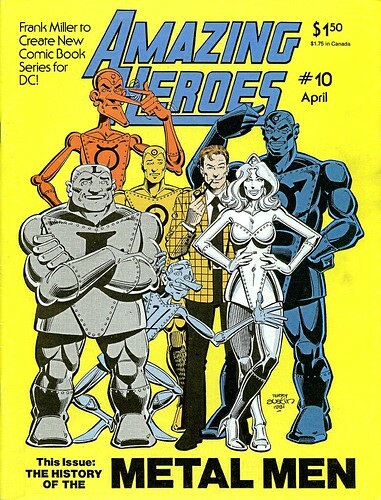 I've written about them extensively here, I've got a PVC set of the entire team, and I'm currently buying the Doom Patrol comic just to read the excellent MM backup series by Giffen/DeMatteis/Maguire. In going through a bunch of Amazing Heroes back issues, I came across this Metal Men cover by Terry Austin. This appeared in AH #10, 1982. Nuff said!